These enchiladas have a lighter, fresher flavor than those made with red chiles or chile powder. 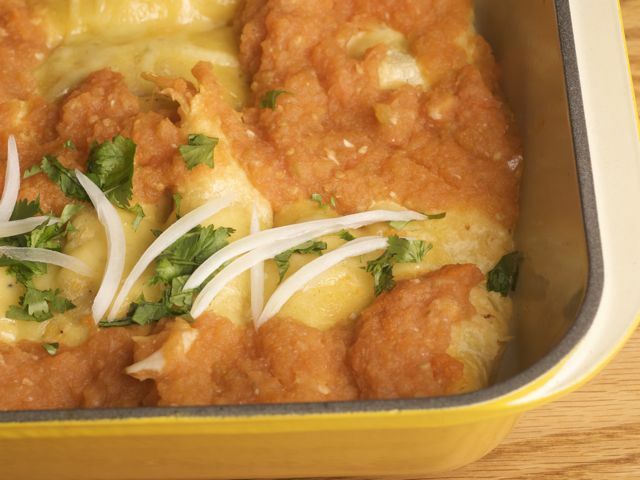 This recipe will make 12 small enchiladas, to serve 6 at most. If you leave in the jalapeño seeds, the sauce may taste spicy when you sample it, but it loses a lot of its bite when it comes out in the final dish. Serve with rice and beans or a green salad. Place chicken in a medium saucepan. Add water to cover. Add salt. Bring to a boil. Cover, and turn down heat to low. Simmer for about 15 minutes, then turn off heat. Reserve 2 cups broth from the cooking water. When chicken is cool enough to handle, shred. Meanwhile, preheat broiler. Place tomatoes, garlic cloves (unpeeled), jalapeño pepper, and onion on a rimmed baking sheet lined with foil. Broil vegetables on top rack of oven for 10 to 15 minutes, turning occasionally, until blackened in spots. Place garlic, tomatoes, jalapeño, and onion in blender. Add reserved chicken broth. Purée. Heat a skillet over medium-high heat until hot. Pour in sauce mixture carefully, as it may splatter. Boil for about 5 minutes over medium-high heat until sauce thickens and color darkens. Season to taste with salt and pepper. Set aside. Heat corn tortillas in a skillet, drizzling each with some of the oil. Wrap tortillas in foil. Set aside. Preheat oven to 450 degrees. Have a 9-by-13-inch baking dish ready. Heat chicken in the now-empty skillet. Keep warm. To assemble: Dip each tortilla in sauce. This will coat the tortillas only lightly; most of the sauce will remain in the skillet. Place the tortillas, sauce side up, on a work surface. Place one-twelfth of the chicken in each tortilla. Then add generous 1 Tbsp. cheese to each. Roll up and place, seam side down, in baking dish. Sprinkle remaining cheese along the middle third of each enchilada. Bake for 5 minutes, or until cheese is melted and enchiladas are heated through. Meanwhile, bring sauce to a boil on the stovetop. When enchiladas are heated through, remove from oven. Pour remaining sauce over ends (not the middles, which will have cheese on them). Garnish with cilantro and thinly sliced white onion. Serve immediately. You can prepare the sauce and chicken ahead of time and refrigerate both until needed. At that point, heat chicken and sauce before proceeding with recipe. Culinate editor's notes: Make this dish vegetarian by skipping the chicken and using cooked beans, rice, and shredded cheese to fill the tortillas. Add crunch by scattering toasted hulled pumpkin seeds (pepitas) over each serving.